I tend not to travel in the summer because 1) it's too hot in many destinations so it's a little hard to see the romance and charm when it's a sweltering 90 degrees and 2) too many tourists on summer holiday. Instead, I'll be taking a trip to Paris, all in the comfort of my air-conditioned home. 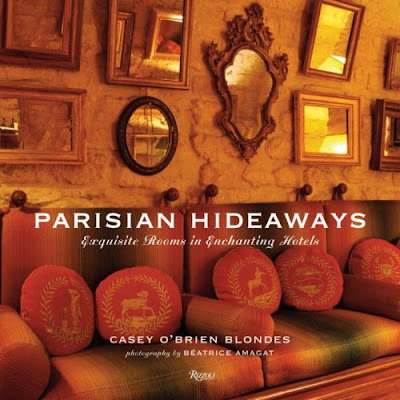 I finally had the chance to read my copy of Parisian Hideaways: Exquisite Rooms in Enchanting Hotels by Casey O'Brien Blondes, and it's really something else. 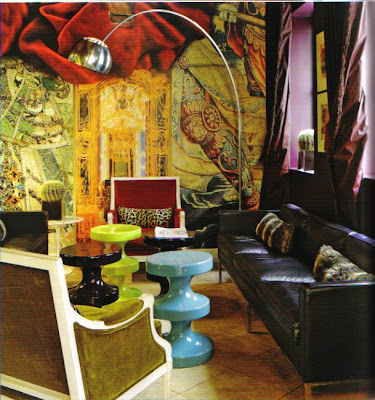 Each chapter features charming Parisian boutique hotels that are unbelievably stylish. 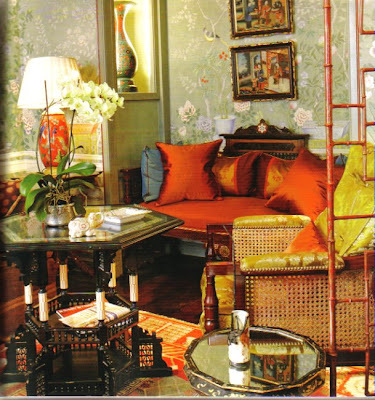 Some are very traditional and very French while others are slightly eccentric. Now, how many times have we read articles in which homeowners said that they wanted to duplicate the hotel look in their homes? I never understood that because isn't home supposed to look like home? Why do I want to feel like I'm living in the lobby of a W hotel? The hotels featured in this book are completely different. 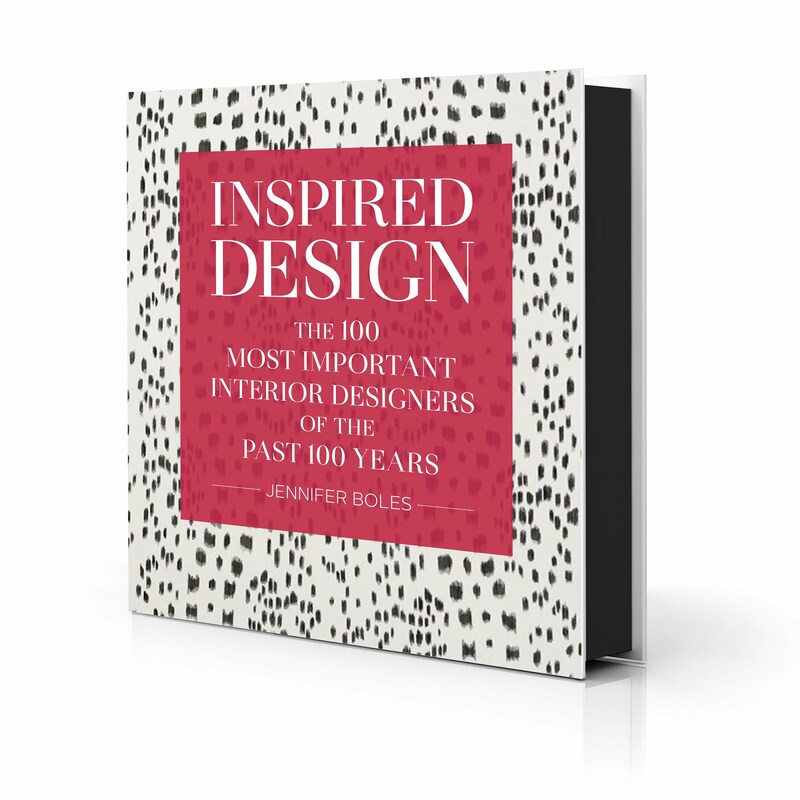 You will get a lot of decorating ideas from these hotels and this book (at least I did). In addition to the glorious photos, there is interesting information about each hotel as well as lists of the hotel owners' favorite restaurants, shops, and museums. I think what I liked most about this book is what a surprise it was. 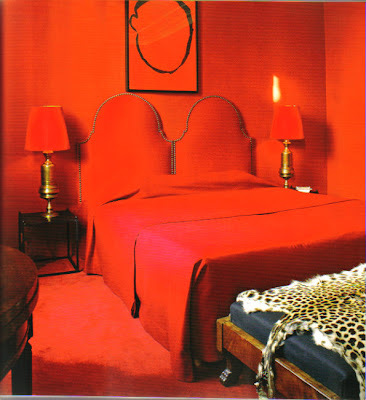 A book on hotels is usually not up my alley, but when the hotels are as gorgeous as these, well, that's a different story! For years now, I've been madly and head over heels in love with prints. I assure you that I was discriminating; don't think that I fell for every print that came down the pike. 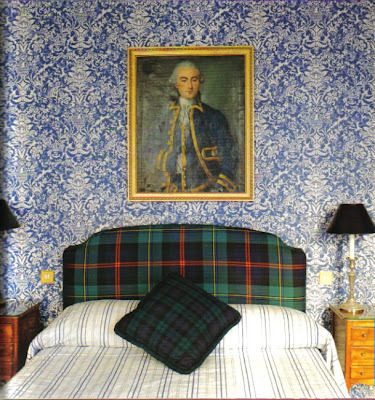 Prints by Albert Hadley, Sister Parish, Alan Campbell, and Quadrille were my passion. And I was discreet too. I had enough sense to know that one, maybe two were enough in a room. But now, I'm looking for something different. Perhaps something a little more subtle. 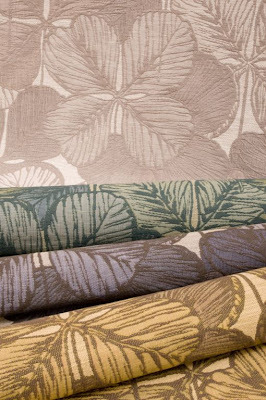 One fabric collection that caught my eye was Donghia's Spring 2009 offerings. 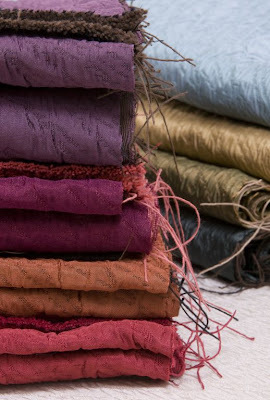 The new line, the first designed by Creative Director Chuck Chewning, is all about rich color, intriguing texture, and a few soft prints. 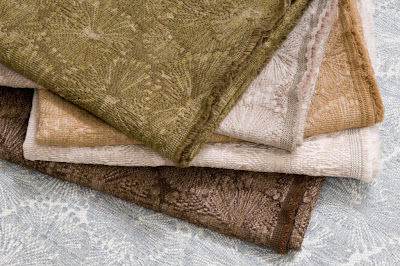 This is the type of fabric that adds sophistication and maturity to a room. The kind that forces other prints to behave themselves and not slip into immaturity or silliness. Of course, first loves never die, and I have a feeling I'll be buried with my Albert Hadley prints, but sometimes, it's nice to explore other options. "Hera". 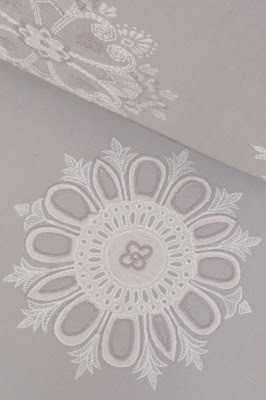 The hand-embroidered medallions are feminine and sweet, though certainly not cloying. "Bell'Insetto". Hands down one of my favorites in the entire collection. The name means beautiful insect in Italian. Come on, how can a bug not be beautiful when used on silk damask? 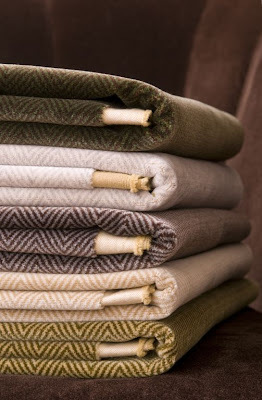 "Cashmere Velvet Herringbone". Or maybe this one is my favorite. 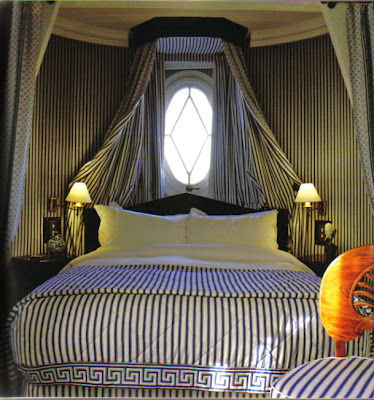 So luxurious and so masculine, especially with that chevron pattern. "Ella". A bit more casual and free-spirited than the others, this textured cotton four-leaf clover print would work well in less formal surroundings. "Encanto". 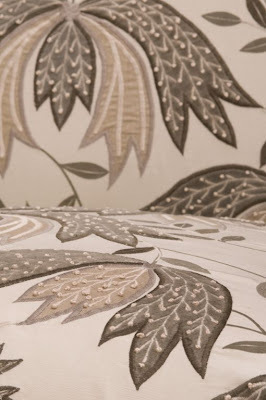 The appliqué, printing, and embroidery is all hand-finished. Oh, the flowers and vines have embroidered French knots on them as well. "Estrella". While I tend to go for richer, more saturated color, I do think the soft color palette is soothing. Don't you want to rub your hands over that texture? Images at top: "Ripple". First, the colors are so rich and gorgeous. And that sheen! While I'm on the subject of balconies... 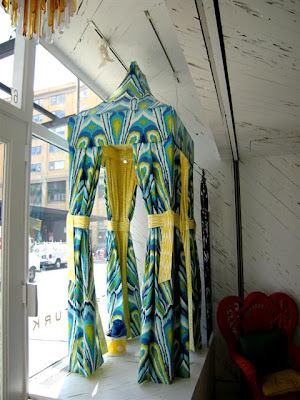 I mean terraces, I thought I'd post these photos of two cabanas installed at Trina Turk's New York store. 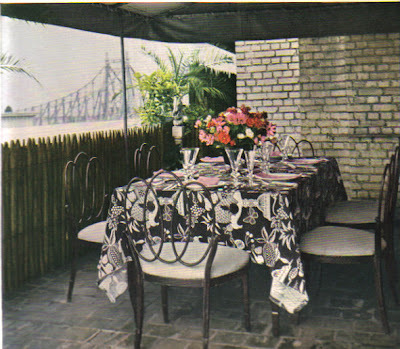 Turk commissioned talented designer Joel Woodard to create cabanas (also known as changing tents) based on some frames that were featured in the Tony Duquette book. Woodard tweaked the tents and made them taller than your run of the mill cabana. 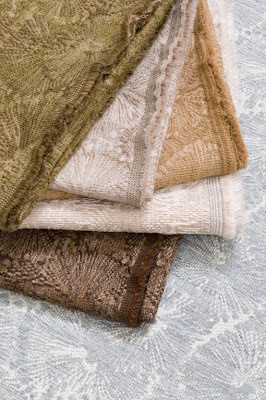 He used fabrics from Turk's new fabric line at Schumacher. 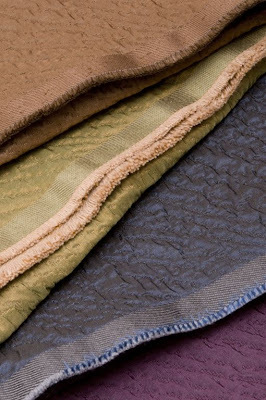 The exterior fabric is "Peacock" in the color pool, and the interior is lined in "Zebra" in the Bamboo colorway. How great would it be to have one of these by your pool, on your terrace, in your dressing room. I'm convinced that the tents' height will make one look slimmer, especially in a bikini! Am I the only person who decorates her home's interiors first and deals with the outdoor part later? For the past three weeks, I've sequestered myself inside in order to meet a few deadlines, and the entire time I kept looking out the window at my poor, neglected balcony. Wouldn't my grotto chairs look a lot nicer with a chic outdoor fabric? (They came with Naugahyde. Who the heck puts cheap vinyl on elegant grotto chairs??) How about a tablecloth for my bistro table? And trellis- that would be awfully nice. It's really crazy that I live in Atlanta and don't have a balcony dressed to the nines. After all, it never gets too cold here, so one can entertain outdoors about nine months out of the year. I'm turning over a new leaf, though. What I realized is that the promise of a party is what forces you to get your house- and balcony- whipped into shape. Like I said a few weeks ago, I'm having a party for my sister in August (I will continue to mention this because once something is in print, you can't go back on it.) I've also mentioned it to many of her friends as a kind of save the date thing, although to me it's a "You better get your act together and finish what you've started... or else." 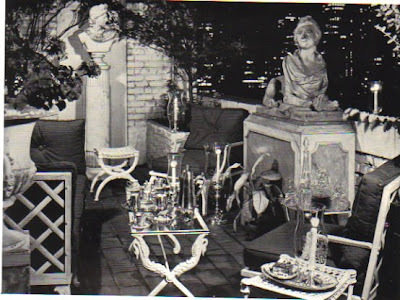 I've pulled lots of photos as inspiration for my sadly neglected balcony. Can I get it together in two months? Well, do I have any choice? I've been taken with this balcony since I first saw the photo over ten years ago. The wrought iron furniture, the sculpture, those oversized hurricanes... perfection. I think I have my work cut out for me. "Supper on a Romantic Terrace". First, can I call my high-rise balcony a terrace? It sounds much nicer. 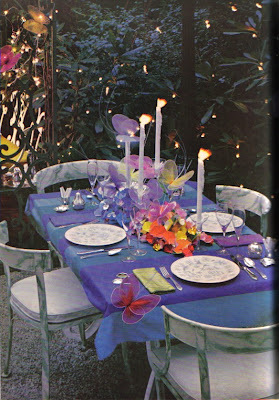 Anyway, truth be told, I wouldn't add those butterflies to my tablesetting because I just don't go to that much trouble in my decorating. 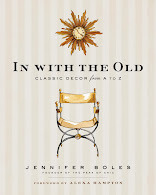 However, I would add white lights to my boxwoods (that I have yet to buy), and if I had plain patio chairs I would consider painting them in faux-marbre. I'd nix the wooden fence- for some reason, it looks a little Trader Vic's to me. 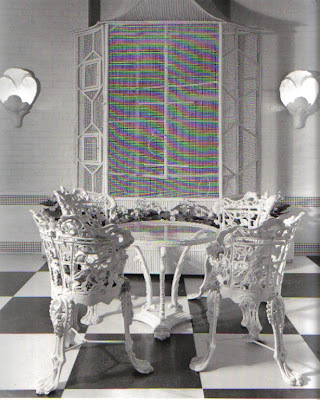 But I do love those chairs and the black and white tablecloth with pink napkins. Perhaps I've found the color scheme for my party? Obviously, this ballroom is far grander than my outdoor space, but isn't all of that treillage just beautiful?? 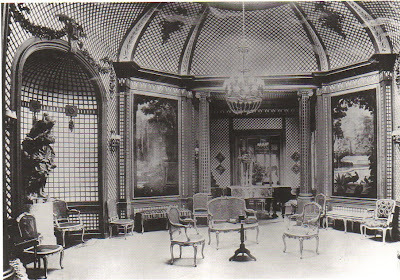 Elsie de Wolfe designed this space for Bessie Marbury. 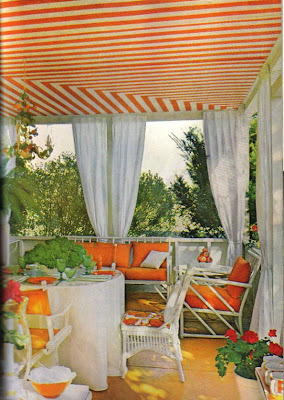 Awnings are always right for a balcony, and I do like those graphic stripes. Two months and counting...the pressure is on. Image at top: Technically, the old Garden Lounge at Hampshire House wasn't outdoors, but Dorothy Draper's handiwork could certainly work on a patio or balcony. I'm going to have to sign off for a few weeks while I work on a project that demands my attention. If only there were more hours in the day, I might be able to work, blog, and get my trash TV fix. But, for right now, the blog and the trash TV will have to be put on the back burner. (I guess that means no Real Housewives of New Jersey, which is probably a good thing. My IQ won't suffer in the process!). See you back here after May 18th! Don't have too much fun without me.